Mysore Pak: Mysore pak is a rich sweet dish from Southern India, prepared in butter, usually served as dessert. It originated in Mysore. It is made of generous amounts of ghee, sugar and gram flour. Mysore pak was first prepared in the kitchens of the Mysore Palace by a palace cook named Kakaasura Madappa out of the above ingredients. The cook at the Mysore Palace kitchen simply made a concoction of gram flour, ghee and sugar. Grease a tray with 1 teaspoon ghee. In a non stick pan, melt a teaspoon of ghee on medium-low flame. Roast the gram flour till it emits a nice aroma, takes about 10 minutes. Remove the roasted gram flour from heat. Mix this sifted gram flour with 3/4th cup of ghee and make a smooth paste. In a deep wide non-stick pan, add the sugar and add 1/2 cup of water. After the sugar gets dissolved, stop stirring and boil till the sugar syrup reach one string consistency. Add in the gram flour-ghee paste. Note: The consistency of the sugar syrup is more important else you will get hard or crumbled mysore pak’s. Change the flame to medium-low and stir continuously adding the remaining 1/4 cup ghee at frequent intervals. Cook, stirring vigorously, till the mixture leaves the sides of the pan and doesn’t stick to the bottom. Transfer the cooked mixture to the greased plate. Spread evenly using a spatula. Let the mixture cool down a little bit (warm temperature). Cut into desired shapes with a knife or a pizza cutter. Mysore pak’s are ready to be served. Serve the mysore pak’s at room temperature. 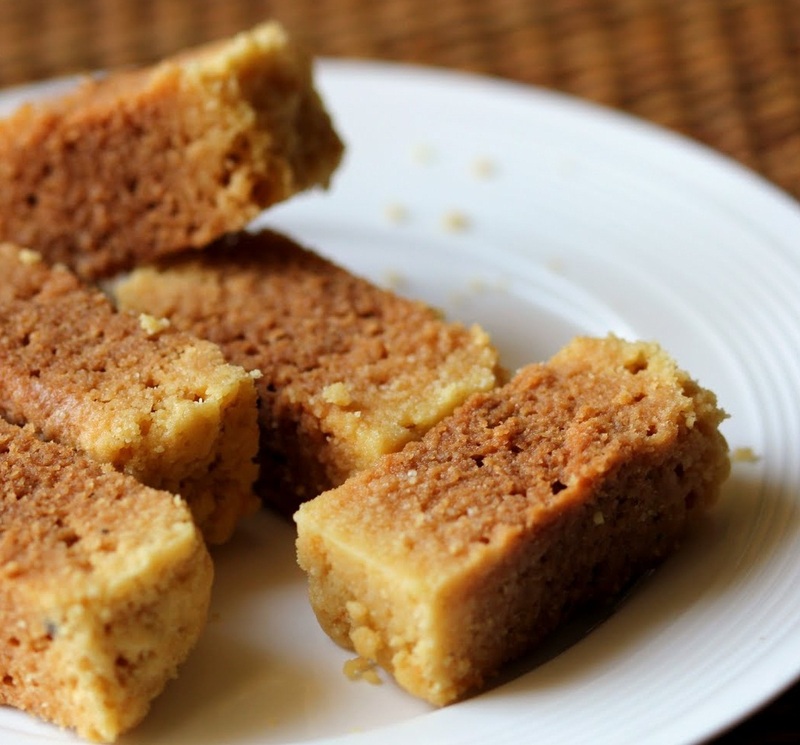 If you have any queries regarding the Mysore Pak recipe, please leave a comment.